While Middleburg is known for its equestrian community, Lovettsville for its German heritage and Oktoberfest, and Leesburg for its history and as the seat of government and courts, the Town of Round Hill is just beginning to build a distinct identity. Throughout the past few years, the town has been working to become a community known for active living, nature education and outdoor recreation. According to Town Planner Melissa Hynes, residents in the past have felt a bit isolated from the rest of the county. It’s Loudoun’s largest town without a community center or public library, for example. She said that this shared feeling of being left out, however, has helped the town find its identity as a center for outdoor recreation. 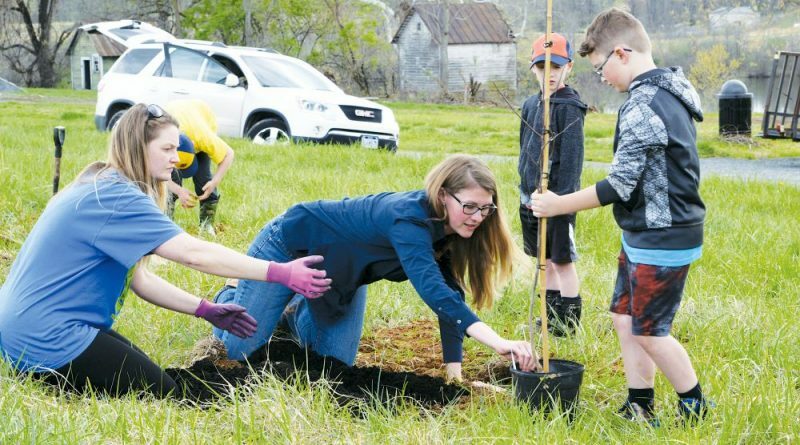 Just in the past two weeks, Round Hill hosted two Earth Day events and an Arbor Day event that attracted about 75 volunteers to plant more than 50 trees and about 400 plants. This week, from April 30 to May 6, the town is promoting Screen-Free Week, a national program that encourages communities to unplug from digital entertainment and enjoy activities like playing outdoors, reading and exploring. Kathi Hottinger, a child care provider and organizer of the town’s screen-free week, said more than 500 children have put their devices down and are choosing to go hiking, participate in game nights and scavenger hunts, go to the library and more. The initiative to make Round Hill a destination for outdoor recreation began four years ago, when the Town Council found that 35 percent of residents were interested in active recreation, like running, playing sports or kayaking. It also found that 12 percent were interested in hiking and 10 percent were interested in hobbies that involve being outdoors. “It’s a very active town,” Hynes said. To address this common passion for healthy living, the town has been working on multiple park and trail projects to accompany the existing county-operated 30-acre Woodgrove Park and neighboring indoor aquatic center. This summer, the town plans to open the 8-acre Niels Poulsen Park, which will feature a playground and trail with eight fitness stations. On June 9, it will also open Sleeter Lake Park. Three decades in the planning, the 11-acre park will be used for passive recreation like fishing, picnicking and canoeing. Also in the plans is the Round Hill Pedestrian Greenway project, which will connect different neighborhoods via a 3-mile pedestrian path in the coming years. The Franklin Park Trail, a 1.5-mile-long bike and pedestrian trail connecting Round Hill to Franklin Park, should open early in 2019. The Town Council also set out to promote environmental stewardship in its 2017 Comprehensive Plan by highlighting the town’s relationship with the Appalachian Trail, which has access points five miles to the west. Last July, the town formed a committee that has been preparing an application to the Appalachian Trail Conservancy to become an official trail community. “The biggest benefit honestly is to be able to have cooperation and learning with other Appalachian Trail communities,” said Julie Judkins, the conservancy’s director of education and outreach. The committee more recently morphed into the Round Hill HANDS program to promote healthy living, active recreation, nature education, the discovery of area parks and support for the trail. In February, the program hosted an Appalachian Trail art show that featured about 30 pieces of art that portrayed the trail. “The Town Council wanted to build on Round Hill’s location and embrace the community’s love for hiking, outdoors and active living,” Hynes said. By December, the town will also submit an application to the Arbor Day Foundation to become a Tree City USA. The next town event will be a 6-mile community hike along the Appalachian Trail from Keys Gap to the David Lesser Shelter on Saturday, May 5, from 9:30 a.m. to 2 p.m.
← Editorial: A Surplus School?